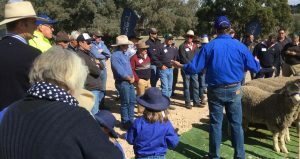 2017 Field Day proved to be a success with large numbers attending. We had an amazing Field Day last month. Our speakers placed a great deal of effort into their presentations and it was well received. Craig Wilson, Craig Wilson and Associates, again empowered our sheep breeders to grow better sheep to capture profit. Robert Bell, Formula Ag, illustrated in physical terms how to maintain sheep in condition score. Rochelle Satara, Tru Test, and Eric Harvey, demonstrated the ease and the way in which an auto drafter can work in a business. As wool prices have increased recently and wool can be grown longer at a faster rate, the benefits of 6 months shearing was explained by Craig French, Landmark. Craig provided a very easy understanding of the benefits of 6 months’ shearing. It is also very encouraging to receive positive comments concerning our rams at a number of recent field days.